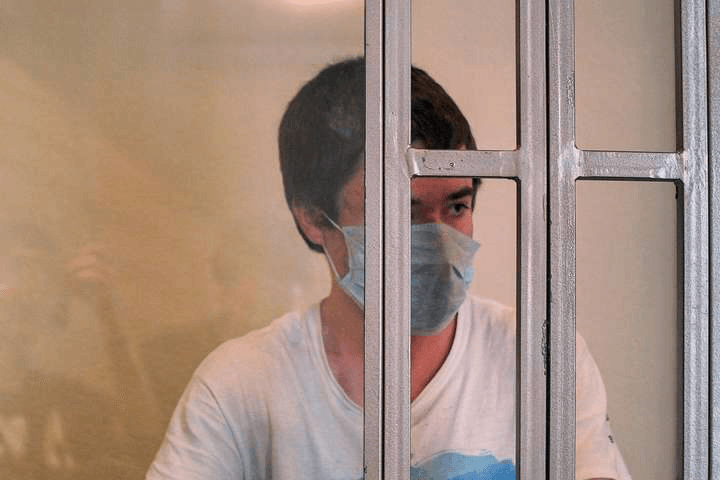 Pavlo Hryb, a 20-year-old severely ill Ukrainian student kidnapped to Russia and accused of aiding terrorism, was on 22 March 2019 sentenced to 6 years in prison by the Northern Caucasus court in Rostov on Don. Immediately after the sentence, Hryb announced he is launching a hunger strike – a form of protest against not receiving the crucial medical treatment he needs. Hryb has not received medical aid for his rare illness which is progressing severely; his father Ihor says that Pavlo may die if he doesn’t receive a crucial operation. On 24 August 2017, 19-year-old Ukrainian student Pavlo Hryb went to meet a girl. Then he got kidnapped by the Russian FSB, tortured, transported more than one thousand kilometers away, and accused of aiding terrorism, becoming one of the minimum 70 Ukrainian political prisoners of the Kremlin. This was all possible because the girl was Russian, and Pavlo met her in Belarus, where the Russian special services apparently work freely. The prosecutor and judges have ignored Pavlo’s testimony that he was abducted as well as his severe medical condition, which rules out detention altogether. The remand prison had not allowed Pavlo to receive life-supporting medicine for the first 15 months of his detention, ignored Pavlo’s complaints and the conclusions of the Ukrainian doctors monitoring his health since childhood. In result, his condition has deteriorated so drastically that ambulances were called in regularly to the court hearings and his symptoms now include cirrhosis of the liver and a rare form of Alzheimer’s disease. Pavlo met Tatyana Yershova online. The 17-year-old schoolgirl, living in the south-Russian city of Sochi, had espoused pro-Ukrainian views. Pavlo, a philosophy student with a strong interest in Ukrainian history and nationalism, found common ground with her and the teenagers started corresponding online. Then, according to the Russian FSB, the 19-year-old son of a Ukrainian border guard attempted to convince the schoolgirl to place a self-made bomb in her school #26 and detonate it on graduation day, 30 June 2017, after which Tatyana was to leave Russia. There was no explosion, but the FSB operatives, having received access to the messages of the young people, decided to open up a criminal case against them. They came to search the flat of Yershova and forced her to collaborate, promising that they would not arrest Hryb but merely see what he was up to. In exchange, they promised to give her a foreign passport, with which she could leave Russia. The young lady planned to move to Ukraine to live with Pavlo. Pavlo’s defense asserts that the young people met each other in the VKontakte social network, had corresponded for a long time, after which decided to meet in the Belarusian city of Gomel. FSB operatives, having read the messages of the young people, decided to lure Pavlo out with the help of Tatyana. On 24 August 2017, Tatyana and her mother flew in from Sochi, Pavlo traveled by a bus from Ukraine. The meeting lasted an hour, the teens hugged, Pavlo gave Tatyana an edible present and 7,000 rubles, she gave him a paper heart. Tatyana said that now that they met, she’ll receive a foreign passport and will come to live with him. Then a taxi came for Tatyana and her mother, and Pavlo was left standing near the bus station. Half an hour later, Hryb was abducted by several people without uniforms. He was found two weeks later in the remand prison of Krasnodar, being arrested on suspicions of terrorism. The accusation, however, claims that they detained Pavlo on 25 August in the Russian city of Yartsevo 420 km away. FSB claimed Pavlo was strolling without purpose on the train station and agreed to come to the police station to submit fingerprints, after which it turned out he was on the wanted list. There’s a problem with that story, Pavlo’s defense claims. Why did the teen have a bus ticket to return from Gomel to Ukraine? Why was there no administrative protocol for an illegal border crossing, which should have been the first thing the police in Yartsevo would have concluded? And how could the investigator from Krasnodar, which is 1,500 km away from Yartsevo, have arrived to question Pavlo at already 10 AM, if Pavlo was allegedly detained at 8 AM? According to Pavlo’s version, which he explained in a letter to the Russian outletNovaya Gazeta, five unknown people shoved him in a minivan after the meeting with Tatyana in Gomel and drove him into a forest. “They beat me on my legs and stomach, filming it, took away my documents and return ticket. Then they took me into a gym. I remember it had a climbing frame. They threatened to hang me on it upside down. They bound weights to my hands. They took me to the toilet, but didn’t give me any food or drink. After that they took me to the investigator. He said: ‘Either you recognize all of it, or you remain here’,” Pavlo wrote. Later, he retracted his testimonies of aiding a terrorist act as given under duress. Pavlo was supposed to return the same day. He left in the morning and should have returned in the evening because it wasn’t so far away. At that time, we weren’t too far from the border. But, when Pavlo didn’t return that evening, my wife and I waited until morning and we knew something had happened. So, I decided to travel along the same route as Pavlo. And, it’s only because I did this, only because I was able to find out that Pavlo had been taken by the Russian FSB that I could raise this issue in Ukrainian media. I knew that he’d been kidnapped because the FSB wouldn’t have acted otherwise. Uncertainty is the most difficult thing to bear. At the bus station, I approached the police, told them I was looking for my son, that I was from Ukraine; I showed them my documents, and when they, on my request, checked their computer and told me that Pavlo was on the FSB’s most wanted list, I breathed a sigh of relief because I knew that Pavlo was alive. Russia has accused Pavlo of prompting Tatyana to detonate a self-made bomb at school graduation day. As proof, they are using the Skype conversations of the two teens, during which Tatyana was sent a nitroglycerine recipe from Pavlo’s account. Pavlo did this, according to the side of the accusation, because he was driven by hatred to Russians; to prove that such motives are plausible, they claimed that he was a member of the UNA-UNSO nationalist organization. But the nitroglycerine recipe was a general one freely available on the internet, and it was impossible to implement at home, his lawyer Marina Dubrovina argues. As well, Pavlo shared the Skype account with another young man, Stefan Kapinos, who could have been the one to actually share the recipe. Furthermore, Censor.net.ua journalists were unable to find any traces of Pavlo in any Ukrainian nationalist organization. Now Pavlo denies his guilt and says that there were so many mistakes during the investigation that there could be no fair trial. This is a change from his initial position when he partially acknowledged his guilt; Pavlo’s parents believe that the FSB pressured him into taking all the blame to save his sweetheart from jail when he had a state-appointed lawyer. “He didn’t want to blow up any school. The kids didn’t have any serious plans like this. […] They just concocted a case out of nothing,” his mother Maria Hryb believes. And it’s “concocted,” lawyer Dubrovina tells, out of Tatyana’s testimonies and their Skype conversations, the VKontakte messages. In the materials of the case, these messages are not in the original Ukrainian, but translated to Russian. Pavlo claims this translated text is altered – the teens didn’t say some of the things present in the materials, Dubrovina stated. There are reasons to believe that Tatyana Yershova’s testimonies were forced out of her as well. “At the first interrogation, she told that the investigator wrote the testimony for her and she only signed. She explained it to me like this: ‘The investigator told that if I want to help Pavlo, I need to sign them.’ The girl is 17, she has never been interrogated before. I think they mislead both Tatyana and Pavlo,” Dubrovina told Novaya Gazeta. Also suggesting that investigators were writing the interrogations themselves is the change of Tatyana’s friend Maria Yuristova’s testimony. At the preliminary interrogation, she had told that in the spring of 2017, Yershova spoke about a bomb recipe she found out about from Pavlo Hryb. But in November 2018, Yuristova partially retracted this testimony and claimed in court that she never heard from Yershova that Pavlo had offered her to assemble and detonate a bomb wherever. Speaking to TSN after the trial was over, Yershova said that if she could turn time back, she would never have agreed to that trip to Gomel back in August 2017. Pavlo Hryb suffers from a childhood disease. When he was 4 and a half years old, he was diagnosed having portal hypertension. He was treated in the “Okhmatdyt” hospital of the city of Kyiv. At a press conference back on 18 October 2018, Vasyl Prytula, Professor of the Faculty of Pediatric Surgery at the Bohomolets National Medical University and Hryb’s doctor, spoke of the young man’s condition which even under normal conditions would be classified as of medium severity. Where the patient is under stress and in unfavorable conditions and deprived of supporting therapy, his state of health can only be qualified as grave. Russia is ignoring the fact that Hryb has very serious blood circulation issues, including portal hypertension, and needs specialized care and appropriate conditions, such as a diet, regimen, and constant medication. Neither are provided in a Russian remand prison. Recently, Professor Vasyl Prytula from the Bogomolets National Medical University issued a new opinion based on medical exams carried out on Hryb in December 2018. Russia has flouted a previous order from the European Court of Human Rights and has not allowed Prytula or any other Ukrainian doctors to examine the young man. Professor Vasyl Prytula found, among other issues, that Hryb’s portal hypertension, hypersplenism, including enlargement of the spleen, are developing, and he is now suffering from liver cirrhosis and reduced ability for blood coagulation (heightening the threat of blood hemorrhages). Professor Vasyl Prytula said that before the Russian court on 5 March 2019 when he was allowed to present evidence. He stressed that Hryb’s illnesses cannot be treated in a remand prison where he is detained in any case and that such persons cannot be held in a remand prison as this may cause further aggravation of the state of health. That hasn’t been taken into account by the judge. Hryb further receives no medical aid from the Russian side, and for the first 15 months of his detention, has been barred from receiving the necessary drugs. Pavlo has been complaining of acute stomach pain and nausea before the most recent court hearings but says that the remand prison staff simply gave him a pile of pills and sent him to the court. There he said that he was in such pain that he couldn’t possibly register what was going on and an ambulance was called. Nevertheless, each and every time, the court continued the hearings after the ambulance gave him a painkiller injection. Speaking to Currenttime.tv, Pavlo’s father said that, as a result of not receiving medical aid, his son was developing the early stages of liver cirrhosis and a form of Alzheimer’s. “If he does not receive the operation he needs, he will simply die,” his father pleaded.